406 Brewing in Bozeman, Montana. Montana is best known as Big Sky Country. Mention of this mountainous majesty of a state conjures up images of wide open spaces, free-flowing rivers and pristine views. Boasting more than 50 breweries, the state’s beer industry is strong and continues to grow, in the southwest region of the state in particular. A budding beer hub is taking shape in the Gallatin Valley towns of Bozeman (where two more breweries will open in 2015) and Belgrade and neighboring Paradise Valley’s Livingston. 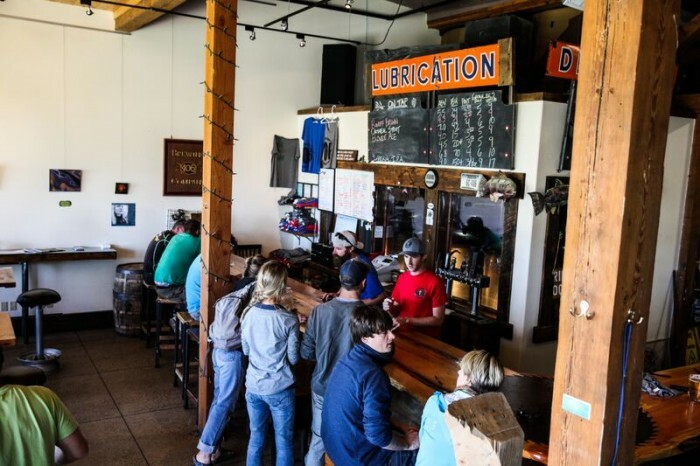 Accessibility to these breweries is made easy thanks to their close proximity to the I-90 corridor and the Bozeman Yellowstone International Airport (BZN). Renting a car and bringing along a camera are highly recommended as you are bound to encounter scenic views. Upon your arrival, stop at Bridger Brewing (1609 S. 11th Ave.) for daily happy hours from 2 to 4 p.m. Located near Montana State University, the brewery opened its doors in early 2013. During the semester, the college scene makes up a large part of the clientele, but you will still find a good mix of locals at the bar. Try the flagship IPA, Vigilante, which head brewer Daniel Pollard refers to as an entry-level “sessionable” Northwest-style IPA, with hints of caramel and biscuit and a balanced, but not overpowering bitterness, thanks to Chinook, Cascade and Centennial hops. The single-hop Lee Metcalf Pale Ale is a two-time award-winning Montana Brewers Association Fall Festival Gold Medal beer. Bridger also has a reputation for some of the best pizza in town, according to a local 2014 poll. If pizza isn’t your thing, take a short drive or long stroll through campus toward downtown Bozeman to Montana Ale Works (611 E. Main St.). Established in 2000, this award-winning restaurant and bar makes its home in a retro-industrial railroad freight house and features 40 taps—one of the most extensive regional beer selections in the Northern Rockies. Here you will find locally sourced, upscale dishes like bison potstickers, house-ground beer burgers, or the roasted beet and grilled asparagus salad. Wind down after dinner with a pint and game of pool on one of the billiard tables that line the back wall. Fuel up for the day’s adventures with a hearty breakfast at a local landmark, The Western Cafe (443 E. Main St.). Iconically nicknamed Bozeman’s “Last Best Café,” a spin-off of the state’s moniker, “The Western,” as locals call it, features rustic, but classic diner styling and down-home Montana cooking right on Bozeman’s main drag. Order the The Rocky Mountains: eggs, apple wood-smoked bacon or sausage, hash browns and toast. If you are especially hungry, the chicken-fried steak served with a side of eggs, hash browns and toast is sure to appease even the most ravenous of appetites. Brewery tap rooms won’t open until noon or 2 p.m. Looking to improve your mind? Consider a visit to Montana State University’s Museum of the Rockies (600 W. Kagy Blvd.). Featuring a vast collection of dinosaur fossils and several complete skeletons, some of which were found in Montana, the museum is home to well-known dinosaur specimens like Tyrannosaurus rex and triceratops. After leaving the museum, grab some snacks for the road at Bozeman’s Community Food Co-op (908 W. Main St.) and prepare for some sightseeing. Head east for 26 miles on I-90 across the Bridger Mountains to the town of Livingston, located in the picturesque Paradise Valley. The Absaroka Mountains act as a backdrop for this mountain town, and the Yellowstone River runs through its heart. Your first stop will be nautical-themed Neptune’s Brewery (119 N. L St.), which in addition to beer, serves up favorite bar food and sushi. The Bozangeles Light Ale is a crisp, light pilsner with a slight bitterness that even the nondiscerning beer drinker can appreciate. For a Belgian flair, give the “She May” Knot a try. Aged for three months and naturally conditioned, this ale has a fruity ester aroma and soft yeasty flavor character. Next, head back up the main drag to area newcomer, Katabatic Brewing Co. (117 W. Park St.) located down the street from Livingston’s historic Murray Hotel. Owners Brice and LaNette Jones began beer production with the help of their Great American Beer Festival award-winning brewer, Jason Courtney, in the fall of 2014. Katabatic refers to the down-sloping, sometimes severe winds that are common in the area. The space is beautiful and inviting with a long L-shaped bar and walls covered with exposed brick and reclaimed barn wood. The bar’s foot rail is a Montana Rail Link train track pulled out of a yard in Livingston. Head to the car and make the drive back to Bozeman for a visit to Outlaw Brewing (2876 N. 27th Ave.). This brewery keeps a range of regular beers on tap year-round and switches out new seasonal releases every six weeks. Beers names like Horse Thief IPA, Hangman’s Imperial IPA and the gluten-friendly Gambler American Amber stay true to the brewery’s outlaw theme. A small-capacity brewery, Outlaw started in a facility slightly less than 250 square feet in neighboring Belgrade. It expanded production capacity in December 2014 when it moved into a 2,400-square-foot facility on the north side of Bozeman. Wind down at 406 Brewing Co. (101 E. Oak St., Suite D). This brewpub caters especially to those who appreciate variety with its ever-changing beer lineup and is sure to have something to suit almost every palate, from the always-evolving Hop Punch IPA to a classic oatmeal stout. For dinner take your pick of artisan breads, pizzas and calzones made using the brewery’s beer, plus sandwiches, soups and salads. Just like the beer list, the menu changes weekly in line with ingredient availability. Monthly changing gallery showings from local photographers and artists make for a beautiful backdrop to enjoy music by local bands. Experience a rustic breakfast of biscuits and gravy with a side of bacon at the Stockyard Cafe (1018 E. Griffin Dr.), cooked up in a rugged, retro bungalow at the former location of the Bozeman Livestock Auction. After breakfast, take a short drive to the trailhead of the “M” trail to hike and take in some amazing views. The iconic 250-foot-tall white “M,” which marks the summit of the trail, was first inscribed onto the mountainside of the Bridgers in 1915 by Montana State University students. Dependent on whether you take the easy or difficult loop and your fitness level, expect the hike to take anywhere from 45 to 90 minutes. From the top you’ll have an unobstructed view of Bozeman. Before leaving town, grab a beer at the oldest operating brewery in the area, Bozeman Brewing Co., established in 2001 (504 N. Broadway Ave.). Support local charities in the process at the weekly Sunday FUNday event, which features a different nonprofit every week. Fifty cents from every pint sold benefits the chosen non-profit. The flagship beers of this brewery are made up of the strong, bold and fruity Hopzone IPA; Plum Street Porter, with its rich blend of seven malts and hint of chocolate; a slightly malty and mildly yeasty hefeweizen; and the Select Amber Ale. A variety of seasonal rotators like an imperial IPA, kolsch and pilsner are available throughout the year. This brewery also cans its four mainstay beers, so be sure to pick up a six-pack of your favorite as a souvenir. If time allows, stop in for a bon voyage pint at Madison River Brewing Co. (20900 Frontage Rd.) in Belgrade, which is conveniently located less than a mile from the airport. Founded in 2004, this brewery is famous for its fly-fishing-themed favorites like Hopper Pale Ale and Copper John Scotch Ale and has a great selection on tap to make your goodbye a memorable one. For listings of all the beer stops on this trip, plus others across the state, visit montanabeerfinder.com. Need a logbook to record your adventures to Montana breweries? Get yours at montanabrewerypassport.com. Bozeman is your best option for lodging due to its central location to the breweries you will visit and its wide selection of hotels. To stay within walking distance of downtown, try moderately priced The Lark (122 W. Main St.). For a more low-cost option, try the Lewis and Clark Motel (824 W. Main St.). Summer is the best time to visit southwest Montana, with sunny skies and warm temps in the 70s and 80s. Spring is a little chilly and wet at times. Fall can also be an option, but can be hit or miss with early season snow and cold. Winters are brutal, but can be well worth it for snow lovers, with excellent skiing and snowboarding options in close vicinity. RELATED: Read more beer travel stories from All About Beer Magazine. you would think that the brewers would welcome cider houses into their ranks. There are enough obstacles out there. Why not add to the army not create another adversary. Don’t forget Beehive Basin Brewery in Big Sky, Town Center. Hike Beehive Basin, then reward yourself with a delicious craft beer! Livingston is only 23 miles “East”, of Bozeman.